After representing Bank of America for 27 years, retired Orange County attorney Richard Herr is fulfilling a different kind of commitment these days. He now works to steer creditors away from impoverished senior citizens. He advises seniors facing Social Security problems, elder abuse and eviction. He counsels clients who cant hold back their tears. And, for the first time in his legal career, Herr isnt paid for his services. Herr, 69, is one of 76 retired attorneys who, through the State Bars Emeritus Attorney Pro Bono Program, volunteer legal help to impoverished clients across the state. In turn, the State Bar waives the retired attorneys membership fees  and the attorneys gain access to cost cuts for some MCLE courses. 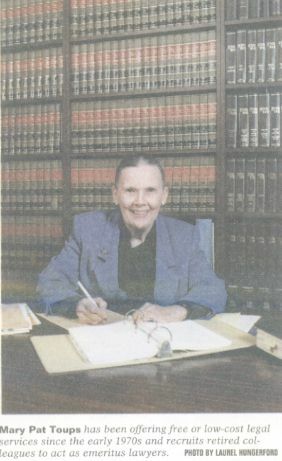 State Bar officials created the program in 1987 to encourage retired lawyers to represent low-income Californians on a pro bono basis. Now  at a time when money-strapped legal services programs are struggling to serve more indigent clients  such volunteers are crucial. To qualify for the program, retired attorneys and judges must be in good standing with the bar and have been admitted to practice at least 10 years ago, with three of the last eight years spent practicing in California. Participants agree to restrict their practice to providing pro bono help through qualified legal services programs or certified lawyer referral services. They volunteer, they say, for various reasons. They want to help others. They love practicing law  but want to control when and how much they practice. They want to give something back. They like the intellectual stimulation. They want equal access to justice for the poor. And they recognize the desperate need for such services. During his corporate career, Herr, who traveled frequently and commuted 2-1/2 hours a day to and from his office, never did any pro bono work. But he made a personal commitment to do so after his retirement. I felt like because I wasnt doing any, I wasnt doing my share, he said. In 1996, Herr retired as assistant general counsel in the banks problem loan and bankruptcy legal group. Seven months later, he began volunteering his services one day a week at the Senior Citizens Legal Advocacy Program (SCLAP) of the Legal Aid Society of Orange County. Alcoholic or drug-addicted lawyers may be able to opt for a diversion program to avoid State Bar discipline under legislation that was to be introduced by Sen. John Burton (D-San Francisco) late last month. Modeled on a program operated by the Medical Board of California for 20 years, the proposed diversion effort is designed to rehabilitate rather than punish and to ultimately benefit attorneys and protect the public. The State Bar Board of Governors will choose its next president from a group of five whose credentials run the gamut: public practice, sole practice, civil litigation, prosecution and criminal defense. For the first time since 1989, all five third-year members of the board are vying to lead the bar as it continues to recover from the devastating 1997 veto of its dues bill and subsequent near-shutdown. The election is scheduled for March 13. California courts made history last month when Kings County became the 58th and final county to unify its municipal and superior courts into a single superior court. Trial court unification was approved in June 1998, when voters passed a constitutional amendment permitting judges from each county, upon a majority vote, to merge their courts. According to an analysis of court unification presented to the Judicial Council in September, the most direct impact so far has been improved use of judicial resources, primarily by offering greater flexibility in assigning judges to cases. In addition, court staff is now used more efficiently through establishment of a single countywide coordinator for major departments and organization by function rather than jurisdictional divisions. The study also found that courtrooms are more fully utilized and some backlogs have been reduced as a result of improved calendars and case management practices. Because of increased efficiencies, some courts have been able to expand programs such as drug courts and services for juveniles.